How Do They Test for Steroids? Steroids, according to TestCountry.org, were designed as a means of elevating testosterone levels considerably in the body while maintaining the effects of testosterone through synthetic materials intended to last much longer than natural testosterone produced by the body. Steroids can have fast and dramatic effects on the body, primarily by increasing muscle mass in the body. Because it is a performance-enhancing drug, many sports leagues have banned its use. Steroid use has been prevalent in some sports leagues for decades, particularly baseball, which has spent years trying to clean up the game and eliminate the use of such performance-enhancing drugs. Steroids can be taken multiple times a day to promote muscle growth, which can lead to increased mass, strength and power. Many bodybuilders also use the synthetic supplement to enhance their physiques. Many sports leagues test for steroids at random to deter athletes from using the drugs at any time. According to TestCountry.org, drug tests for drugs like steroids number more than 100,000 every year, with the total costs exceeding $30 million. Often, urine tests are used, because the samples they require are easier to obtain and test. Some urine tests can also be purchased for home use if individuals suspect someone of steroid use. If an individual is found guilty of taking steroids, many things could happen. She is liable to be banned from the sporting league in which she participates, and various awards and achievements may be taken from her if it is determined that steroids were in her system at the time of those successes. Additionally, because steroids is an illegal substance in many countries, including the United States, monetary fines and even jail time are possible consequences. In addition to urine tests, steroids can also be detected using hair follicles or blood samples. 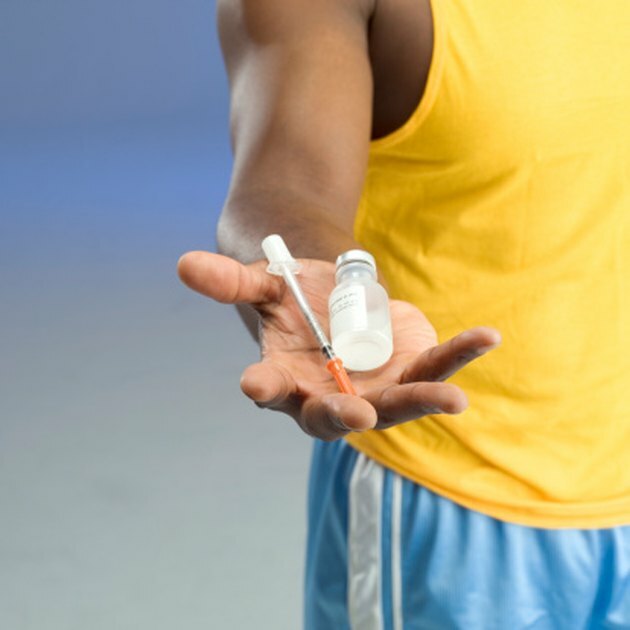 Steroids can be tested for in the say way as with urine — by attempting to detect the presence of synthetic substances found in the body and known to replicate the performance and function of testosterone. Because steroids are designed to have a longer half life than normal testosterone, they can be detected if they have been taken recently. As steroid developers become better at creating substances that can pass drug tests without detection, science has been forced to develop other methods of detection. According to the Los Angeles Times, a type of steroid that disappears when it enters the body can now be detected by observing whether androgen receptors in the body are activated. All steroids function by activating these receptors, so regardless of whether steroids or found, activated androgen receptors can give away steroid use.